Wow. When I started this book, I wasn’t sure what I was expecting. I know I wasn’t expecting what was delivered though. But my, was it a good surprise! Although a little slow off the mark, this book was full of action and mystery and it was incredible! I loved that this novel was set in both England (Oxford and a town I guess isn’t far away) and Paris. This added a depth to the story and made things a bit more complex for the characters due to them being in different countries. I also love Paris (who doesn’t?) but it didn’t just focus on the gorgeous centre, Sacha visited many parts of the suburbs and the areas where tourists don’t get to see, the non-romantic, rougher areas of Paris. This, in my opinion, made it more realistic and believable, as a character like Sacha would not have spent all of his time in the centre. I think that part of this comes from having the two authors, one being french. The novel focused on two main characters: Sacha and Taylor. I especially liked Taylor as I could identify with her and a lot of the things she said and did (especially the spending a lot of time on her studies and everyone gets annoyed with her). I know some people didn’t like Taylor because of this (reading other reviews on Goodreads) as I guess that not a lot of people study as much as Taylor does but I think I can say that I do prioritise studying and books over a lot of things (and like Taylor I have no regrets!) so I liked having a character I could genuinely relate to as it’s uncommon to have one like this. Sacha I found to be quite an angry character at times but I liked the way he changed as events unfurled and I really did like him as the book progressed. The focus changed usually after every chapter to the other character, which enabled me to keep up with what was happening to both of them, rather than it being narrated in two separate parts. Both were in third person, which worked well as it allowed descriptions that would have been held back in first person as the character didn’t understand what was going on whereas this could be explained in third. One thing that I didn’t like was that the other characters in this novel were somewhat underdeveloped. The exceptions being Taylor’s Grandfather and Louisa. Georgie and Tom (Taylor’s boyfriend) were very basic, for want of a better description. Georgie is a strong character, attractive and rarely studies, Tom is basically obsessed with rugby. That’s all I really got. I know they didn’t feature a lot in the story (Georgie more than Tom) but they were important when they did appear and it would have been better if there had been a bit more to them. The magic that is included in the novel really kept me interested as I find the concept of being able to control energy (or something similar) extremely intriguing in books. I also found the idea that it’s something that has to be refined and doesn’t just come perfectly a nice touch because I’ve read books with similar concepts and the person with the power has just been in control from the moment they realise they have it and I just find that a bit unbelievable (yes, I know, I’m talking about having the power to manipulate energy – because that’s believable, but I’m sure you know what I mean)! Would I recommend this book? Yes, yes I would. I really enjoyed it, which did surprise me as there were times when I was contemplating putting it down because creepy people appeared (I’ll say no more, don’t worry) and they really freaked me out… As I said, I just can’t deal with horror / anything remotely creepy. (I wouldn’t call this a horror novel at all!) On the other hand, I am going to sit here impatiently waiting for the sequel because I desperately want to know what happens next! First of all, this book includes everything. Mental illness, LGBT themes, drug use, broken families, bullying. Which makes it sound so morbid. Believe me, it wasn’t. This book had me laughing and dealt brilliantly with all of the mentioned issues. The mental illness was included with empathy but it wasn’t sugar coated either, the same goes for the bullying (and everything else really)! The way that the characters interact is so natural and yet so extraordinary and I really enjoyed this aspect. Some of the things they did were odd (in a quirky, good way!) but nothing was unrealistic! Each one had their own story to tell and each of these stories were told as the book progressed. They stood out in their own right, and I noticed that even the side characters were clearly well thought out and had a background to them (which become clear in the book). A very strong side of this book is the character development. Although at a glance it seems that Jeremy goes through the most development (in my opinion), they all do in reality if you just pause and register it for a moment, particularly the main three. Which is another thing; I liked that there were three main characters – it added variety (as they were all so, so different) and resulted in the story taking all sorts of different twists. One thing I found to set this book apart from others were the multiple points of view throughout. I know you’re probably questioning me now, thinking “loads of books have multiple viewpoints”. Well, for each character, the narrator was different. In simple (understandable) terms: Jeremy was first person, Sebby was second (this I particularly liked as I am a fan of second person and it really worked in this novel) and Mira was third. This helped me to distinguish easily between each character. I know this has been found confusing by some, but I thought it to be a unique and successful feature. The use of second person especially I found to be an interesting choice. As I’ve said, I particularly like it (I’ve used it in two pieces of creative coursework at school, just to give you an idea of how much I like it) and it was great to see it used in a novel which I do not doubt will be extremely popular. Thankfully it wasn’t overused, and thus it retained the novelty and impact that it was undoubtably supposed to have. I also found Sebby the most difficult to understand and these parts in second person really helped to straighten things out and allowed me insight into his character that no other narrative voice could give. The plot was fast paced and exciting, even when negative things happened to the characters. As I said, the issues I mentioned were incorporated well and without glamourising them, as some books do. This book took a realistic stance, and though not blunt, it spoke about things plainly and simply and I appreciated that, as I’m sure many others will too. 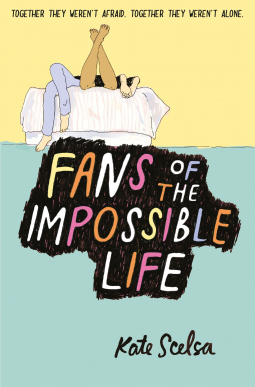 Issues of sexuality and acceptance, mental illness and bullying, should be incorporated more into YA novels (and others too, not just YA) and this book, I believe, is proof that several of these can be included – not just one – and result in a novel with a rawness and depth that is difficult to achieve. I’m sure you can tell that I adored this book. The characters were each special and individual, with their own quirks and mannerisms, and I really appreciated this as I read it. There was a surprising amount of humour included and quite often I’d find myself giggling (usually at Sebby’s antics)! I would definitely recommend this book because it was incredible and I honestly loved it so, so much! 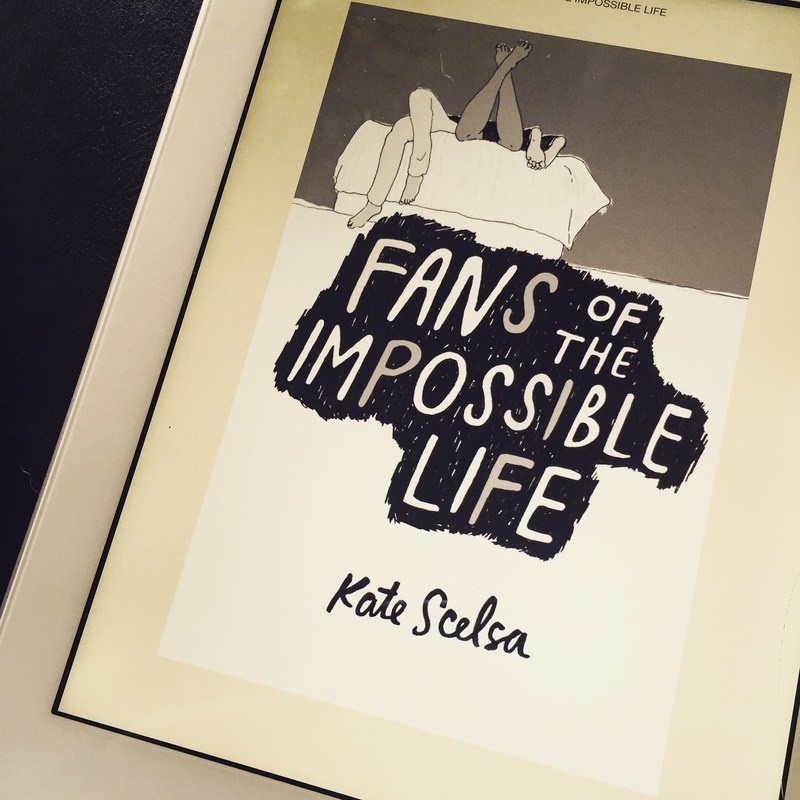 I cannot wait for more from Kate Scelsa! To add to the “Top 3 Books of Whatever Month Just Passed” (Obviously the month is named) monthly thing I plan to do on here, I’m also going to write a “TBR” post in the early days. I’m very much a mood reader, so I’m not saying for certain that these are the books that I’ll read, but they’ll be the ones I’m most eager to get to. I think I’ll probably only list about 2-4 depending on how I’m feeling (like whether there are any books I definitely want to read or I’m just going with the flow). So, for the month of September, I’m listing five (six if I include rereading Hamlet for school). This is possibly too optimistic as I’m going back to school and it’s going to be hectic. But one of these books is for school! All of these are ebooks (Hence no picture!) as four of them I was lucky enough to receive from publishers through Net Galley. The Handmaid’s Tale I just already owned as an ebook. What books do you plan to get around to reading this month? I hope to read all of these, or at least four books (my mind will probably change as to which I want to read next). I’m going to begin, at the end of every month, telling you my favourite three books that I have read during that month. If it’s clear I may order them, but that’s really difficult so I probably won’t every month! Also, if I have already written and posted a review, I will link it. Most of them should eventually be reviewed. This month I have read eight books (a wrap up will be on my YouTube channel next Sunday). This book was such a gorgeous little novel. It was extremely short and a quick read, with a charming set of characters and plot. I don’t think I disliked one of the characters (which is unusual – normally there’s one that irritates me slightly) and could completely picture the locations, even if some of them were a little abstract! This book was amazing. I loved every page of it. It takes a realistic stance when looking at the issue of mental health and there are no typical ‘perfect’ relationships. What Bourne has done with this novel has created something relatable. And I love it. This was the first YA ‘fantasy’ book that I have red (it could just as easily be argued a dystopian – or both) and it was incredible. The plot was intriguing and I felt compelled to keep reading and discover new areas of the Tearling and more about each character. I own the sequel – as soon as I have finished reading for school, it’s being read.